Akita Tsuba Sen. Ugo (Dewa) Province in NW Honshu, now Akita Prefecture - No date (~182 - 1866). Other interesting issues were cast during this inflationary period, including some in lead, copper-plated lead, and silver. Issued as 100 mon, it quickly was reduced in trade value to 80 mon. This is the Long-tailed Phoenix version which is scarcer than a short tailed version. Two Phoenix are shown, one amle, the other female. Trigrams are on the reverse, meaning of which will require some research. Copper, 47.5 x 52 mm by 3 mm thick; mass is 44.8 g. H# 7.3; JNDA 139.10A; KM# 6.2 (ND 1862); my observations indicate the Long Tailed types may be a little smaller and lighter than the Short tailed coin, which might indicate that it's a later cast. 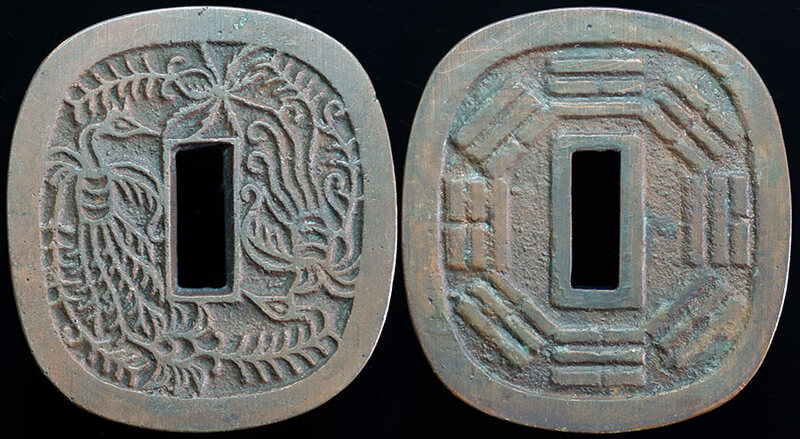 The shape of this coin is probably based on the 'tsuba', or sword handle guard of the Daimyo of Akita. The Eight Trigrams on the obverse were devised by Fu Xi in about 2800 BC in China. Trigram symbols are used for divination associated with the "I Ching" (Yi Jing, Book of Changes). The reverse depicts a male and female Phoenix used to symbolize good luck. The edge should be stamped "kyu" that indicates the Bunkyu era, but it's missing in this example. See my example of the Phoenix with Short Tail version here in the Museum. This specimen, and every one is different, appears uncirculated. The finished coin was well filed, knocking off high points and creating a very smooth rim and edge.